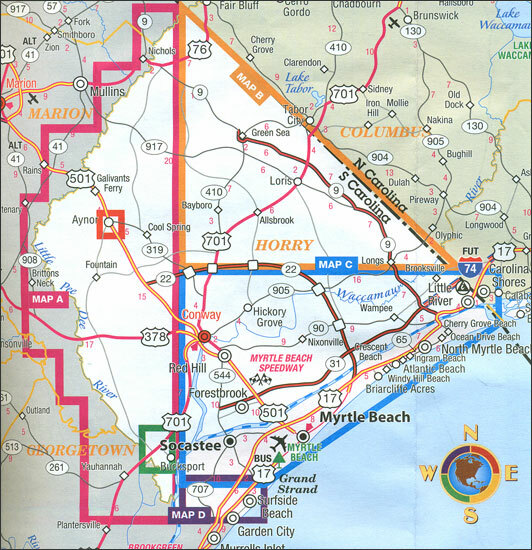 Myrtle Beach and The Grand Strand area on the coast of South Carolina on a double-sided, indexed street plan from Map Supply Inc, with an additional road map extending coverage further inland to cover the rest of the Horry County. The plan highlights various facilities and places of interest, including hiking trails, locations of campsites, beaches, marinas and boat ramps, golf courses, etc. 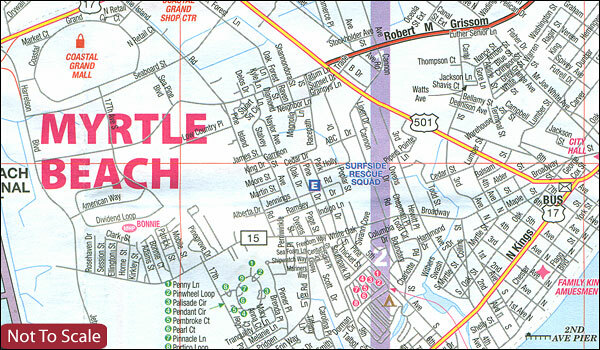 Two locations covered by the road map, Anyor and Bucksport, are also shown in greater detail on street maps. Coverage includes Atlantic Beach, Briarcliffe Acres, Calabash, Carolina Shores, Conway, Forestbrook, Garden City, Little River, Loris, North Myrtle Beach, Red Hill, Socastee and Surfside.